The hidden charm of Vegas' rich, unusual history is often overshadowed by the modern attractions of the Strip. We teamed up with photographer and Vegas local Luther Redd to explore the 'vintage' side of Vegas - a retro desert oasis born out of dreams, danger, and a Dam (the Hoover Dam, that is). The glamour of the Glitter Gulch, which developed in 1950's, is what inspired our Dunes cateye frame - named after the famous Dunes Casino. Ubud is the cultural heart of Bali. This collection of small villages features some of the oldest and most significant temples in Bali, making it a haven of culture and historical artifacts. 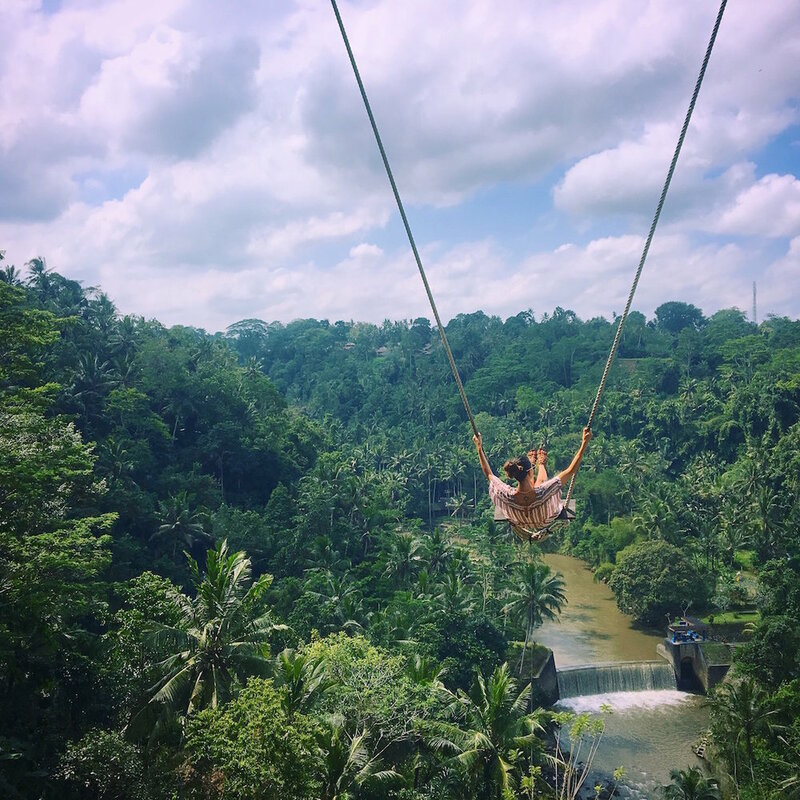 Soak in the rainforests, the traditional food, and the stunning beauty during your first stop in Bali. Located in Bali's spiritual center of Ubud, husband and wife duo built this one of a kind eco friendly and sustainable hotel. 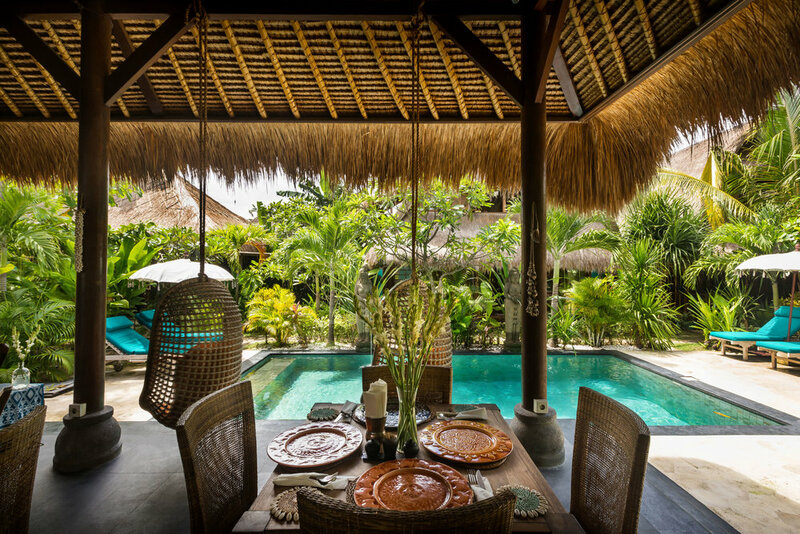 Each bungalow artistically blends bamboo interiors with Javanese teak wood fitting. Fully immersed in untouched forest, rice paddies, and the Ayung River in the distance, your stay at this unique hotel will give you an authentic Bali experience. 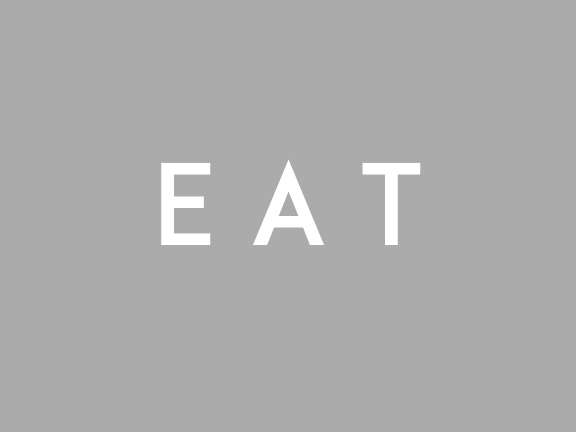 A clean, modern cafe specializing in raw/vegan cuisine. 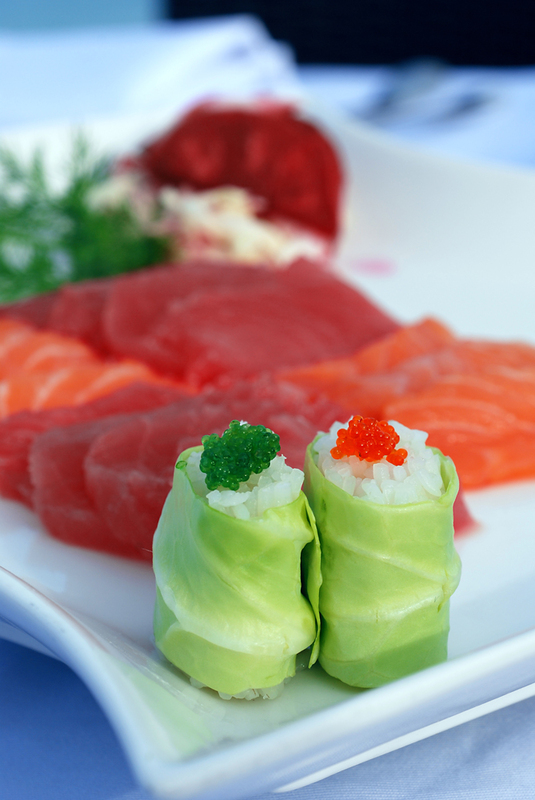 Their extensive menu features juices, smoothies, salads, sushi, dessert, and traditional Bali food. Afterward, you can relax next door at the yoga studio. Inexpensive & delicious Balinese tapas served in an authentic yet Instagram-worthy style. Bali’s fine dining temple. Having won many accolades, it is the most famous restaurant in Bali, if not Indonesia. With carvings that honor Dewi Saraswati, the goddess of wisdom and the arts, and lotus filled water surrounding, this Hindu temple is a must-see in Ubud. 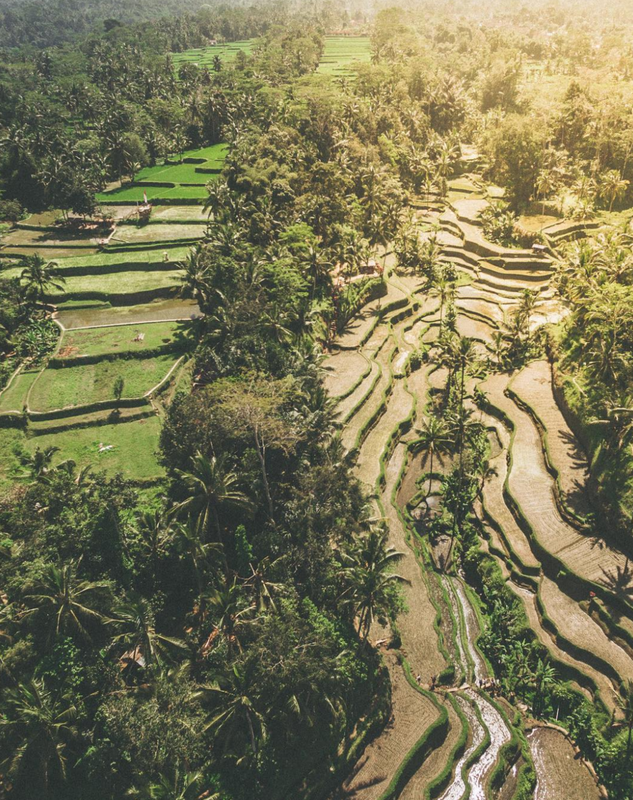 A scenic stack of rice paddies framed by shady palm trees, the Tegalalang Rice Terraces are iconic as one of the best places to visit in Bali, with its fame well-earned. Tucked away in the hills of Ubad and coated in dense jungle is a palm tree swing that allows you to soar over the falls below. The property also houses human-sized birds' nests with an unparalleled view. 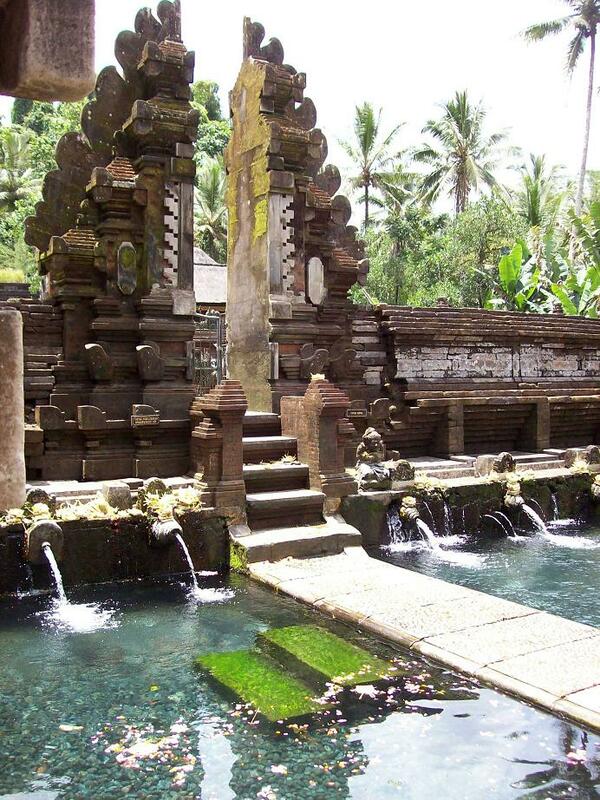 A temple just outside of Ubud where the waters cleanse spirits from sin before prayer. There are 30 "showers" with flowing spring water where locals and visitors can wash themselves and soak up the Balinese culture. On the southern edge of Bali lays this upscale beach resort area. Known for it's gorgeous views, upscale shopping, and great surfing conditions, Seminyak is one of the most popular spots in Bali for tourists. 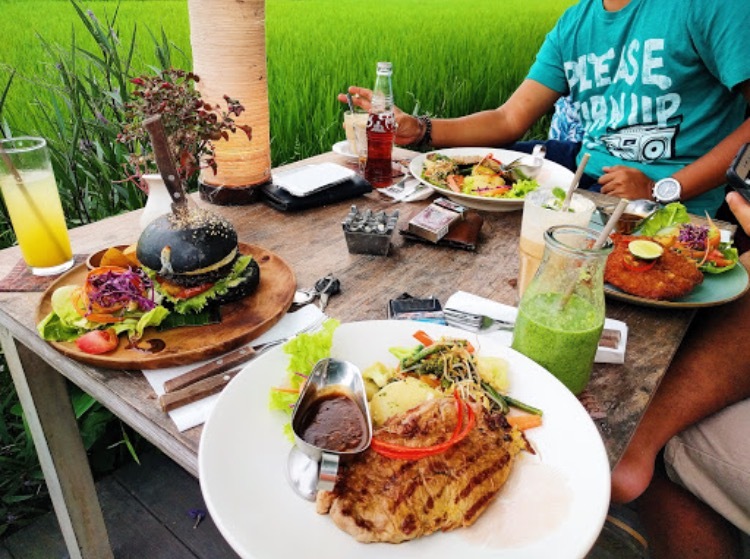 Many of the high-end stores and restaurants in Seminyak have garnered a cult following by celebrities and influencers for their luxurious services. Plus, it's less than an hour from Ubud by car, making it the next stop on our tour of the island. A private luxury resort that blends traditional Bali style with contemporary amenities. Each villa is surrounded with tropical gardens and has its own private pool. This AirBnb villa is modern, youthful, and luxurious, and sits privately on its own lot. It features its own pool and is walking distance from an array of shops, restaurants, and galleries. The surfing vibes and fruity menu make this the perfect place to grab lunch after a morning of hitting the waves. Their bowls feature homemade granola and locally farmed bananas. On the southern-western tip of Bali lies Uluwatu, a small oceanside town known worldwide for its amazing surf. 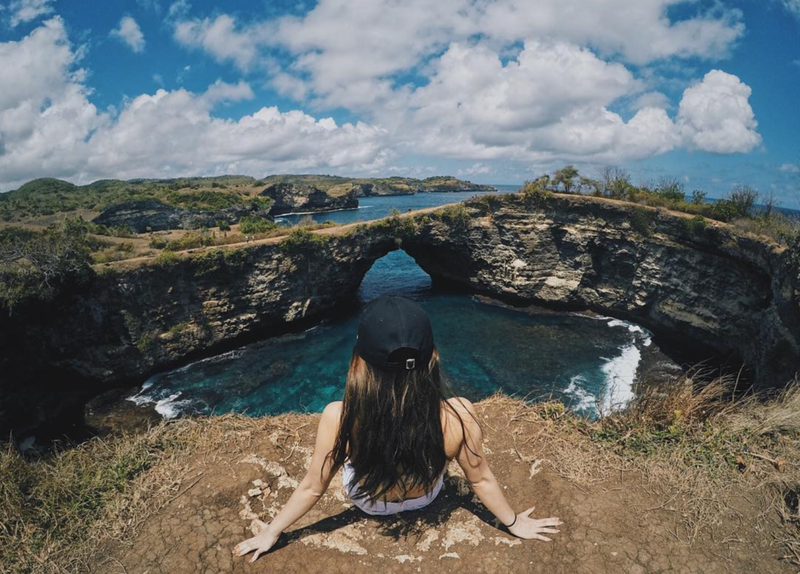 Not only is Uluwatu home to stunning views and relaxing beaches, but it is the namesake for our best-selling pair of sunnies. This eco-friendly luxury resort features an amazing (and instagram-worthy) infinity pool. Take in the stunning natural views from your own private bungalow, which, by the way, is only a 5-minute walk from Uluwatu's famous beaches. These modern villas lie perched on limestone cliffs, overlooking the ocean. Breathtaking views, private pools, enclosed terraces, and innovate architecture await customers. Located near Intercontinental Hotel at Jimbaran, Balique is a beautiful vintage restaurant which serves a good balance of Indonesian food and western food. See and be seen at this Australian-backpacker-filled surfer bar. This place is THE place to be on Sunday's, but every night you can groove to the DJ's ambient beats and watch a gorgeous sunset from the multi-level roof deck that sits precariously over the ocean. Perched atop distinctive rock formations along Jimbaran’s pristine sunset coast, Rock Bar Bali is widely respected as one of the globe’s most popular sunset, cocktail and entertainment venues. For the best seafood in Jimbaran Bay, go to Menega Cafe. Indonesians and tourists go there for a seafood feast while watching the sunset. Sitting at just a 30-minute boat ride off the coast of Bali is a collection of islands named Nusa Penia, Ceningan, and Lembongan. Known collectively as the "Nusa Islands," they don't receive the same amount of tourist traffic as the main island. 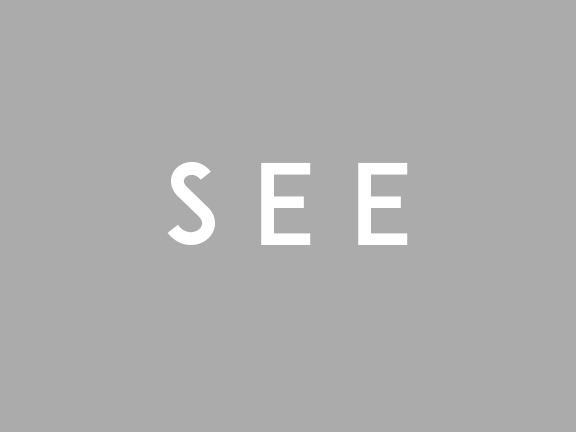 For this reason, they offer relaxing beachside retreats and vast expanses of nature to explore. At about $40 a night, these bungalows make for the perfect Balinesian retreat in Nusa Penida. Located close to the Goa Giri Putri cave temple and overlooking the ocean, the Bukit Sunrise guesthouse gives unparalleled views starting at only $31 a night. A reggae bar that also serves delicious tapas. Tigerlillys feels like a tropical oasis with wooden bungalows, a pool and palm trees all around. 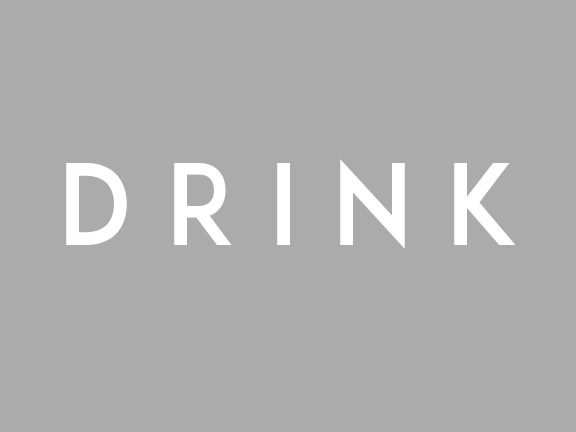 They’re open for breakfast, lunch and dinner, from 7.30am – 10pm. Restaurant & Bar with very fancy dishes and delicious smoothies. Right on the beach with incredibly relaxed atmosphere. The Deck is the epitome of a tropical oasis with insane views, whitewashed wood and flowers all around. Definitely a place to include in your bucket list. A local bar overlooks this 10m high cliff jumping point, where you can leap into the crystal clear waters below from 6 m, or for the more adventurous traveller, 10 m.
The forest itself is a virgin forest, located directly on the coast and bursting with ever-old and gigantic trees. This beach is named after the animal that fills its waters: giant Manta Rays. Local snorkel agencies litter the area and offer tours and equipment for cheap. The Broken Beach takes it name from a naturally created geological arch that seperates the ocean from a gorgeous cove. Northeast of the Nusa Islands, closer to the West Nusa Tenggara is a much smaller trio of islands called the Gili Islands. 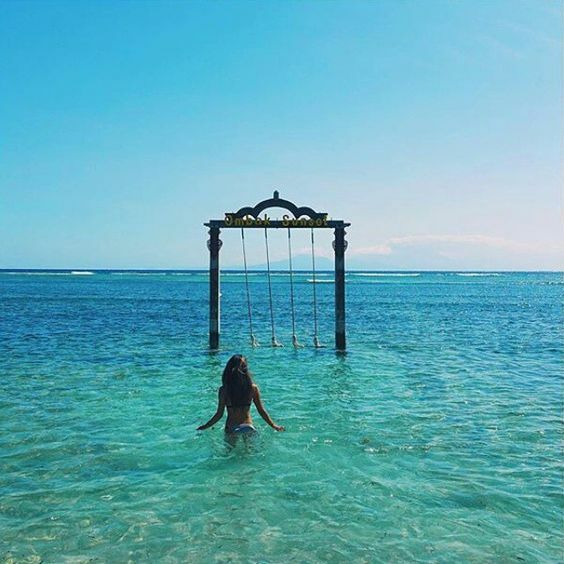 Featuring gorgeous white-sand beaches and luxury resorts, the Gili Islands are a vision of paradise. Since they are only 2 hours from Bali by speedboat, the Gili Islands are definitely worth a stop. This four-star hotel is perfectly located at the end of the main strip, away from the noise but close enough to the bars, restaurants, the market, and boutiques. Featuring two outdoor swimming pools and a beachfront restaurant, it’ll be difficult to leave this place! Mahamaya is the classiest restaurant on Gili Meno. 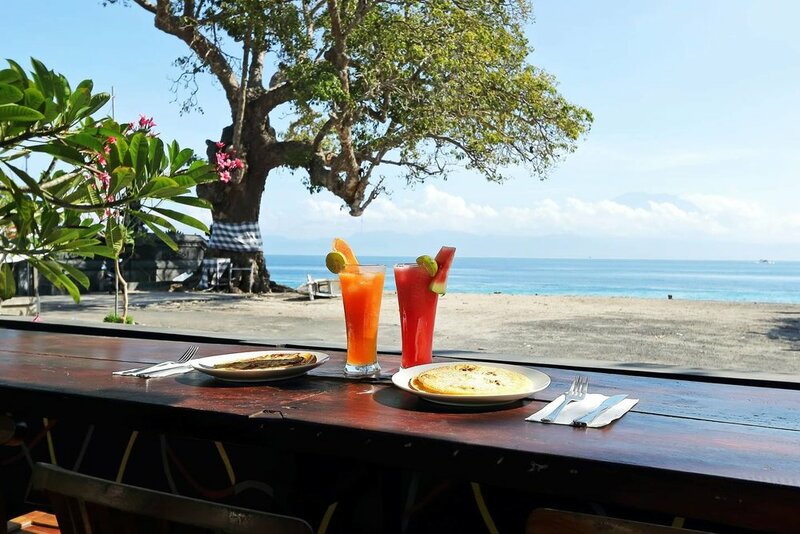 Located on the beach on the quiet Gili Meno Mahamaya, it is the perfect place for dining under the stars to the sound of the waves lapping on the beach. 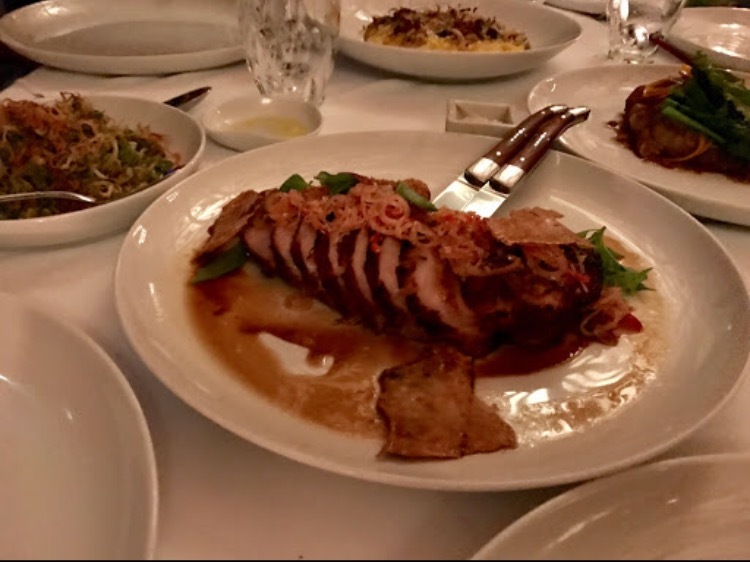 The food is a fusion of Asian and Western, and you can watch as the chef at Mahamaya cooks your dishes in the open kitchen. Pearl Beach Lounge is a dream of a beach restaurant. A beautiful large bamboo structure, placed right on a white-sand beach, overlooking the deep blue ocean, makes the Pearl Beach Lounge, the perfect setting for dining in the tropics. Rated on the food alone, Ko Ko Mo is the best restaurant on the Gili Islands, and when it comes to ambience and atmosphere, few places (if any) can compete with Ko Ko Mo’s location right on the beach. 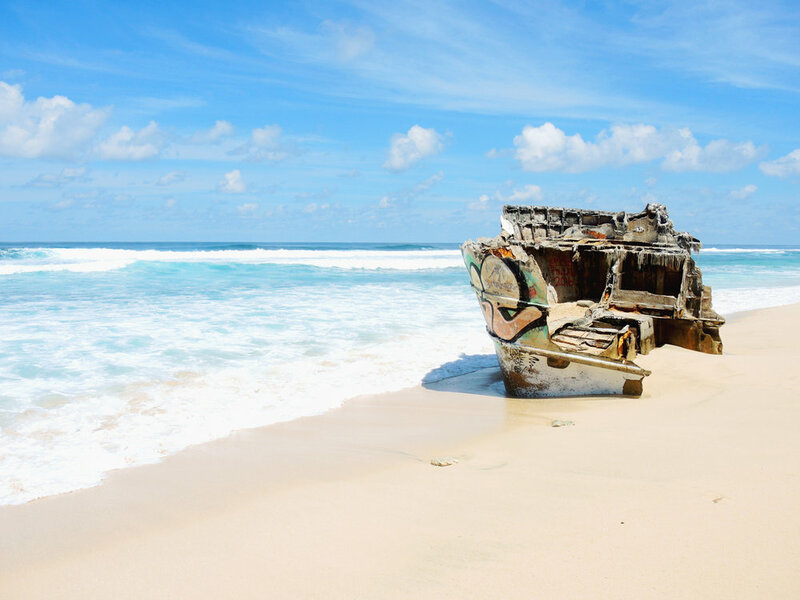 Take a boat ride to visit Gili Air and Gili Meno. You'll discover beautiful beachfront lounge spots as well as floating swings and hammocks that hang above the most relaxing horizon you could ever imagine. A great place to hang for the afternoon to enjoy the above-water swing sets that you've likely seen on the cover of travel magazines.